The Global Forum ratedSingapore overall Compliant with the international standard on transparency and exchange of information on requests handled over the period from 1 April 2014 to 31 March 2017. Singapore promptly took measures to address the recommendations in its 2013 report and further strengthened its legal and regulatory framework to ensure compliance with the standard on the availability of beneficial ownership information strengthened in 2016. Singapore has in place an appropriate legal and regulatory framework requiring the availability of all relevant types of information. Singapore also carries out adequate supervisory and enforcement measures to ensure that the relevant information is available in practice, although the practical availability of beneficial ownership information remains to be fully tested. Singapore’s network of exchange of information partners is broad covering more than 140 jurisdictions including through the Multilateral Convention. Singapore has in place a robust program ensuring timely and effective exchange of information. 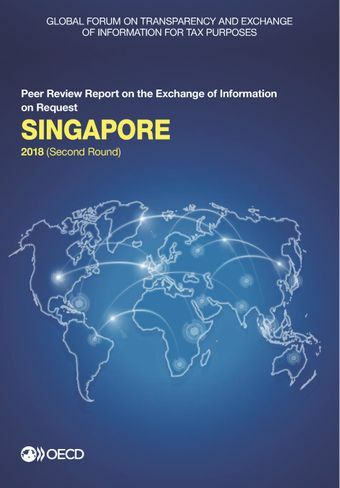 During the reviewed period Singapore received over 1 000 requests, which represents almost triple the number of requests received over the previous period reviewed. Nevertheless, the average response times remain short. Accordingly, Singapore is valued by its exchange of information partners as an important and reliable partner. Read the news release.